What do a popular country band and your mortgage have in common? Probably nothing, unless you’re one of seven lucky winners. A new contest has been launched by, you guessed it, Quicken Loans, and the pop country band Lady Antebellum. The so-called “7FOR7 Sweepstakes” gives seven individuals the chance to get their mortgage paid for one year, but it’ll take a little creativity to win. While no purchase is necessary to take part, you do have to write an essay. And by essay, I mean 50 words or less. Brevity at its best folks. The essay will be judged on three criteria, including “most deserving,” “creativity/originality,” and “clarity,” all equally weighted at ~33% of the total score. But before you even get your essay in front of the judges’ all-important eyes, it’ll need to be one of 25 randomly selected entries picked from among all the eligible entries submitted. There are seven drawing dates corresponding with seven stops during the band’s “Wheels Up 2015 Tour,” the first to take place on April 10th. You must enter by April 9th (by 12:00 p.m. ET) to take part in the first drawing. 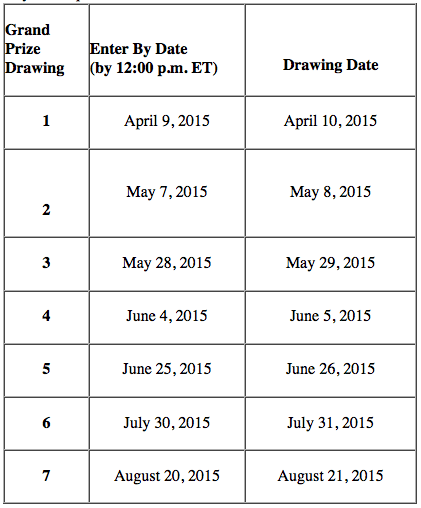 Once you’re in the contest, your entry will be carried forward to subsequent drawings if you don’t win. Assuming you do win, you’ll be awarded an amount between $12,000 and $24,000, depending on your mortgage payment, in the form of a check. If you have a mortgage, you must provide proof of one year’s mortgage payments in order to receive that prize amount. If you don’t have a mortgage, you can still take part, but the amount you receive will be determined via a random drawing of all eligible mortgage amounts between $12,000 and $24,000. So even if you don’t own a home, you can still take part and use the winnings for a down payment in the future. Along with the mortgage winnings, seven grand prize winners will also receive transportation, two VIP tickets, and Meet & Greet passes to a Lady Antebellum concert. You’ll also get your hands on some Lady Antebellum Heartland Bedding to keep you warm at night, along with an autographed copy of the band’s 747 album. There will also be two first prize winners, who will receive everything the grand prize winners receive minus the mortgage money. And 20 second prize winners will get just the autographed album. If you’re interested, you can check out the contest on their website. Even if you don’t like the band, the potential $24,000 in cash ain’t too shabby. Just note that you might receive marketing promos from Quicken unless you opt out. Quicken Loans has been upping its marketing game in the last few years, launching a number of newsworthy contests including their impossible to win Perfect March Madness Bracket and the slightly more practical Quicken Loans Hole-In-One Sweepstakes. These contests have helped Quicken become one of the largest mortgage lenders in the nation, and the number one nonbank mortgage lender. How do I enter for HELP WITH A YEARS MORTGAGE PAID?DISABLED/SINGLE/DIVORCED MOTHER. So desire help to get caught up so i Ican reach out to HELP OTHERS! !